We’ve featured some gorgeous white kitchens over the past year on StyleBlueprint, and now we’ve consolidated them into one easy-to-find article. Each kitchen features white cabinets, but some offer pops of color, as well. We wanted to make sure you had seen each one, as our SB cities often showcase unique content to that specific city. Here are the white kitchens seen across all of our SB cities in the past year. If kitchens are your thing, this is your day! Pin this to your wall to always have these inspirational articles close at hand! This white kitchen is found in Nashville, TN. Architect: Allard Ward; image credit: Wiff Harmer | To see the whole house, click here. An elegant white kitchen! These marble countertops are 5 cm thick, as opposed to the more typical 3 cm, and check out that crystal chandelier! Interior designer: Cantley & Company | For more photos of this kitchen, click here. Look familiar? This house is seen weekly on ABC’s “Nashville” as the home of Gunnar Scott. The kitchen is white, with the exception of the blue island, and it combines a sleek, modern look with rustic sensibilities. The house was designed and renovated by Stratton Exteriors and Urban Properties. Image credit: Lynsey Culwell | To see the entire house, click here. Colleen Locke’s kitchen is small and perfect! We showcased this home decked out for Christmas, but the photos of the kitchen provide year-round inspiration. Image credit: Wiff Harmer |To see the whole kitchen, click here. This stunner was designed by Pierce & Co. Do you see the fabulous family seating at the end of the kitchen?! Image credit: Wiff Harmer | To see more of this home, click here. The marble backsplash takes center stage in this white kitchen by Twin Construction. To see more of this home, click here. Van Mol Restoration created a beautiful home, which includes this white kitchen. The space provides a great gathering spot for family and guests alike. Image credit: Shannon Fontaine | To see more of this home, click here. 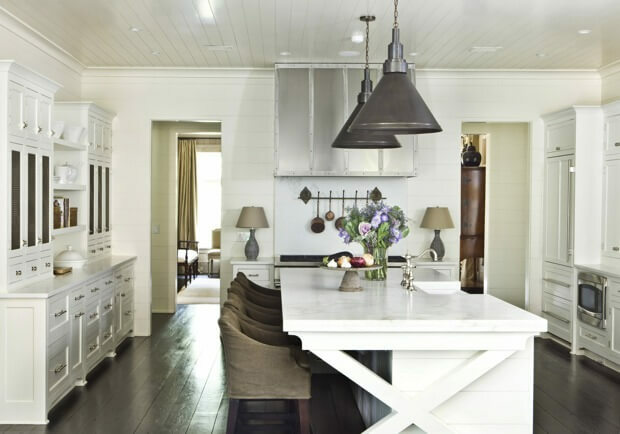 This white kitchen was part of an article on an award-winning ranch-style house renovation by The Wills Company. Image credit: Wiff Harmer | To see more on this entire home, click here. When you see the before photos of this kitchen … wow, what a transformation! The warm rug and darker island help this white kitchen feel cozy. Interior designer: Caroline Smith; Image credit: Julie Wage Ross | To see more on this renovation, click here. This lived-in kitchen always looks calm because of the stark white cabinets with white countertops. Interior designer: Crowell + Co Interiors | Image credit: Brad + Jen | To see more on this kitchen, click here. Another white kitchen by Crowell + Co. Interiors, this before and after showcased what a tight budget and creative thinking could accomplish! Image credit: Brad + Jen | To see more on this kitchen, click here. A warm, white kitchen … the tiles are gorgeous in their simplicity, and that hood … wowza! Interior designer: Cantley & Company | For more photos of this kitchen, click here. A white kitchen with pops of serious color! If you have an all-white kitchen that you want to add some color to, here is a great way to do just that: paint the ceiling and the island, and add some bright bar stools. Builder: Hammond & Brandt Builders; image credit: Wiff Harmer | To see more shots of this kitchen, click here. This white kitchen is found in the historic Malvern House in Louisville, KY. It’s been updated to blend with the house while providing modern sensibilities. Interior designer: Lee Robinson | To see more of this home with a rich history, click here. The different hardware and copper farm sink make this white kitchen stand out. Interior designer: Cantley & Company | For more photos of this kitchen, click here. 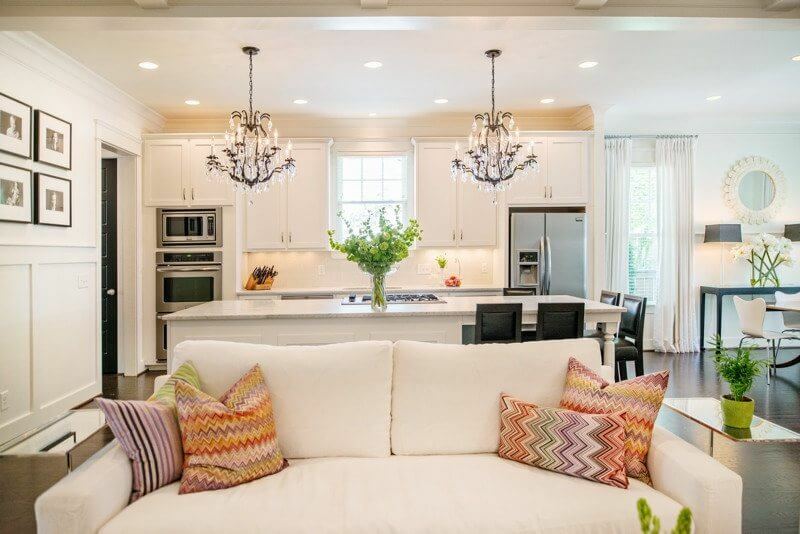 This gorgeous white kitchen is the result of a complete home renovation. Architect: Christopher Architecture and Interiors; to see more of this fabulous home, including more photos of this white kitchen, click here. This is a house that makes use of every inch, including their white kitchen, as it’s a part of their living area. With the crystal chandeliers, this kitchen is glamorous, but equally modern. Interior designer: Kathryn Berschback; image credit: Wiff Harmer | To see this entire house, click here. This white kitchen, with the warm metals and welcoming spirit, is one you could stare at for days. Interior designer: Pencil and Paper Company |Image credit: Leslee Mitchell | To see more of this kitchen, click here.